A quick and delightful handmade gift that just about anybody would enjoy this time of the year. In a bowl of your choice, mix together your salts. Then add a few drops of peppermint oil, or any other essential oils of your choice. Stir it up well and breathe in that lovely aroma! Next, pour the salts into an elegant glass container of your choice. 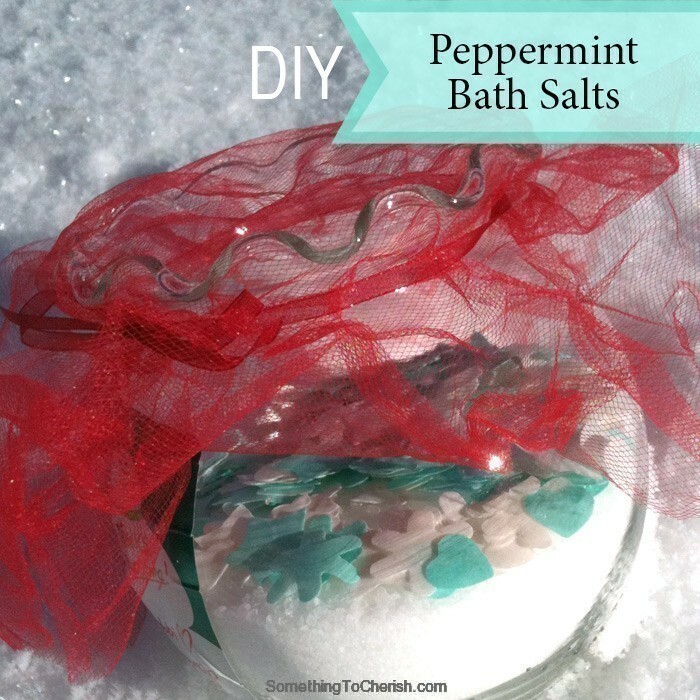 In my version I added a top layer of peppermint bath confetti for color and fun. Topping it all off, I used some red tulle which I tied to the top with a festive ribbon. Now it looks good enough to eat! Peppermint and salts have been used for hundreds of years to soak in and soothe the body, relax away stress and even relieve pain. Who doesn’t need more of that with their holiday schedules? Make some for your loved ones right now. Cherish Flieder is an internationally-featured artist, designer, creative entrepreneur, and award-winning children’s book illustrator. Cherish’s designs have been seen in fashion apparel, books, magazines, greeting cards, gifts, crafts and more. She is the creator of Something to Cherish®, an artisic brand that joyfully connects with the hearts of twenty-somethings to sixty-somethings through her original watercolor mixed-media artwork on pre-treasured gifts, home decor, fashion accessories, and keepsakes. Cherish is also the founder of the art licensing community ArtLicensingShow.com. She regularly teaches marketing, illustration, design and technology at Rocky Mountain College of Art & Design. Connect with Cherish on Instagram, Pinterest, Facebook, Twitter, Google + and LinkedIn. Like it, Love it, Live it! ©2004-2019 Cherish Flieder, Something to Cherish. Please contact for licensing permissions.